As part of the Transition Zone training programme all our students are given training in how to use coaching as a technique for leadership and management. To follow on from the workshop delivered as part of the CDT-EI programme Cohort 2 researcher David Czerski recently attended a foundation course in professional coaching and came away with a Foundation in Professional Coaching Practice Certificate - well done David! Cohort 3 researcher Gergely Hantos reports on the Introduction to Design of Experiments seminar he attended in Bristol on the 2nd of December 2016. The seminar took place in the National Composites Centre (NCC). The seminar was part of the Catapult training programme and it was delivered by Claudius Consulting Ltd. It took place in a computer lab and consisted of a presentation and separate work on the computer using MINITAB software. The presentation familiarised us with the basic definitions and concepts and strategies and statistic methods. A lunch break separated the presentation and the work with MINITAB. This part of the work consisted of various case studies that utilized the information cquired during the presentation. For the better understanding, the same exercises were conducted on the main computer of the lecturer, projected on the screen so we could follow the steps easily. The outcome of each case study was explained and discussed in details. The laboratory work familiarized aus with Plackett-Burman Designs, two level factorial experiments, factorial replicates of two level experiments, response surface designs and the MINITAB software itself. The methods learned will help me to analyse and understand small or large datasets better and to design experiments based on the conclusions I draw from the analysis. This was applicable to the my semester 1 group project and I should be able to apply the techniques to my semester 2 group project as well as during future PhD work. Laverick Webster Hewitt Prize - awarded to recognise outstanding performance in Advanced Control and Systems Engineering masters programme. The Eric Rose Prize - awarded for the best project mark on the Advanced Control and Systems Engineering master programme. Chris joined the CDT-EI in September and is working with Dr Qinggang Meng at Loughborough University, his co-sponsor are Motion Robotics ltd.
On 24 November we held our first Colloquium at Heriot-Watt University. We were delighted to have Alun Morgan, the current Chairperson of EIPC, deliver the keynote address. Alun's presentation focussed on the automotive industry and the development of electronics past, present and future. Following the keynote a number of our students presented their research. Adrian Ayastuy Rodriguez “opportunities of Embedded Intelligence in Livestock Production"
Mohamed Taher “Driverless Cars: Are we there yet? Enhancing safety in cars of the future"
Pawel Ladosz “Trajectory Planning for Communication Relay Unmanned Aerial Vehicles in Urban Dynamic Environments"
The event concluded with a poster session showcasing the group project work our researchers conduct during the first year of study. Attended by CDT-EI researchers, academics and representatives from our industrial partners the day successfully provided opportunity for attendees to hear about the research being conducted in our Centre and to make new contacts. 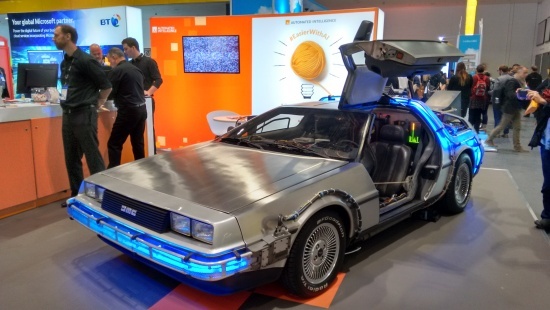 Our 3rd year researcher Dimitris attended the Microsoft’s Future Decoded 2016 (https://futuredecoded.microsoft.com) event, which took place at Excel in London, on November 1 and 2, 2016. The first day was focused on digital transformation of businesses and the benefits it can bring in for stakeholders and customers alike. A number of well-known speakers presented the steps from conception to the implementation of the digital business and approaches to smooth out this -sometimes steep- transitional period. Keynote speakers such as Dr. Ian Levy, the Technical Director of the National Cyber Security Centre (NCSC) (https://www.ncsc.gov.uk) and Mike Bugembe who is currently the Chief Analytics Officer of JustGiving (https://www.justgiving.com) used a number of examples to demonstrate what are the gains from keeping up with the trends in the digital era, but also the potential dangers and pitfalls if misused. The day was concluded with an inspirational speech from Martine Wright, a 7/7 survivor discussing about how an instantaneous event can change entirely the way we think and perceive life and could motivate people to grasp opportunities. The second day was much more technical, where distinguished experts, like Chris Messina, the inventor of hashtag and current Developer Experience Lead at Uber, introduced the technologies of the future, either it being the upcoming augmented reality (AR) revolution, the evolving intelligent messaging platform bots or the expanding blockchain technology. Microsoft has invested significantly in realising these ideas and bringing the tangible results to the public, as either commercial products or services through the cloud. Although most of the demonstrated concepts have already been in the market for quite some time, we had the opportunity to take a glimpse from several world-leading researchers’ work of today, which will be the disruptive technologies of tomorrow. As an example, Dr. Abe Davis, a post-doctoral researcher from Stanford University demonstrated his work on “the visual microphone”, which will enable recovering sounds and noises from silent videos and could potentially have numerous groundbreaking applications. In other side-talks over the two days, Microsoft evangelists and engineers from third-party companies presented the infrastructure, the algorithms and the tools they work on to provide customers with insightful data analytics, prediction models and increase productivity. Several case studies were presented, mainly from the healthcare and the business-to-business sector, to demonstrate the variety of applications that can potentially benefit. In parallel to the main and breakout sessions, more than 50 exhibitors demonstrated their solutions to facilitate the digital transition, offering IT collaboration toolkits, cloud integration services, intelligent IoT-oriented platforms, and virtualisation support. 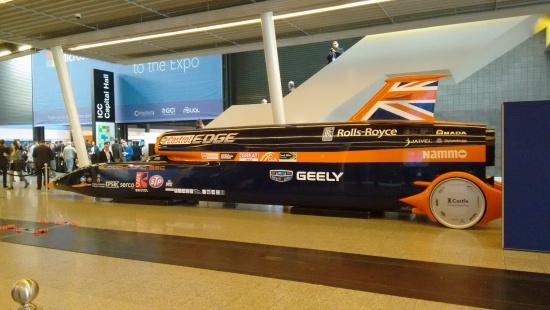 Highlights of the exhibition floor included a real-size replica of the Bloodhound SSC (http://www.bloodhoundssc.com) (photo 1), the British supersonic land vehicle aiming at breaking the world’s land speed record and a, also real-size, model of the legendary DeLorean (photo 2)! Dimitris was lucky enough to try out the new HTC Vive VR headset as well and watch a live demo of Hololens, Microsoft’s high-promissing AR kit..! With an attendance of 4000+ people each day and a selection of more than 200 sessions, Microsoft managed to successfully pull through one of the biggest events of this year on the erupting digital evolution and accurately identify the challenges and highlight the motives for a business to consider the big leap of faith. The total experience is definitely something we are looking forward to repeating next year, and is a must for researchers who seek to be ahead of the market. 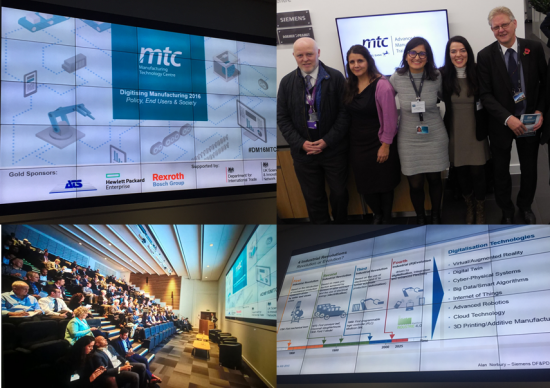 Following on from the success of last year’s ‘Future Factory’ Conference The MTC held its second conference on Digitising Manufacturing. This year the conference themes were Policy, End Users and Society with the conference strands designed to address the most important barriers in the path towards digitisation of the UK manufacturing sector. Opening the conference was Prof Tim Dafforn, Chief Scientific Advisor at the Department for Business Energy and Industrial Strategy. He presented a real-world example of how he has seen the 4th industrial (r)evolution impact individuals and change business models. Throughout the day there was debate as to whether we are seeing evolution rather than a revolution. The following sessions focussed on policy aspects with speakers from Germany, Sweden and the UK highlighting the achievements and visions for the future. The second session of the day was looked at education and training, which is very close to our hearts. Speakers from Siemens, Bosch Rexroth Academy and TUC gave examples of best practice in their organisations for addressing the challenges faced and new skills required for digitisation, this was not limited to new graduates but also providing new skills and training to existing employees to meet the requirements of changing workplace. According to some interesting statistics from the year 2015, 64% of engineering employers in the UK state that the current shortfall of 55,000 engineers with the appropriate skill set threatens their business. Additionally, 32% of companies across multiple sectors currently find it difficult to recruit experienced staff in the fields of Science, Technology, Engineering and Mathematics (STEM); a similar 20 % deficit gap applies at graduate level. As a possible solution, the UK could look to drastically increase the number of people with engineering skills in the future. Prof Paul Conway recently visited Seoul, Korea, for an invited talk at the 15th International Symposium on Microelectronics and Packaging. There were many relevant EI challenges evident in the keynotes – wearable electronics for medical, military and health and well being, driving big data, services and physical packaging challenges for high reliability and challenging operational environments. Paul is Professor of Manufacturing Processes and Head of The School of Mechanical, Electrical and Manufactuing Engineering at Loughborough University as well as being the Director of our Centre.